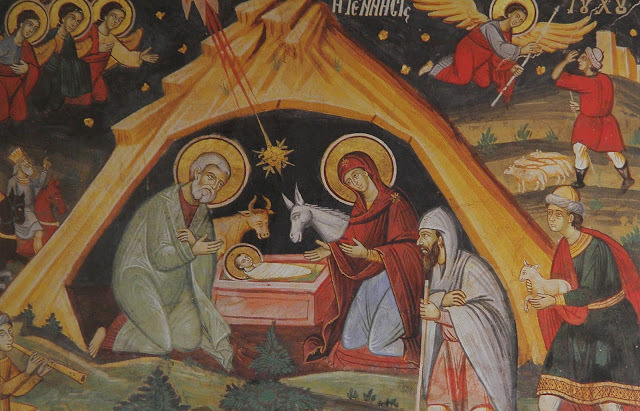 When we talk about the birth of Christ we are speaking of two births. One is the pre-eternal birth of the Word from the Father, according to the divine nature, and the other is the birth in time from the All-Holy Virgin, according to the human nature. This refers to Christ’s two natures: the divine and the human. This theological fact is revelational and above all it is empirical, as the glorified flesh of Christ becomes a source of life for the members of the Church, particularly the saints. In the Old Testament there was the tabernacle of witness, where the pot of manna, the tablets of the covenant and Aaron’s rod were kept in the Holy of Holies. Now, in the New Covenant, the tabernacle is the flesh that He took from the All-Holy Virgin. Christ as God-man is like God the Father and the Holy Spirit in every respect according to His divinity, and like man in every respect according to His human nature. The phrase that Christ is “the image of the invisible God” (Col. 1:15), refers to His uncreated divine nature. The All-Holy Virgin was the greatest gift of the creation and humanity to Christ. The successive purifications of her forebears, her own struggle and, most of all, the grace of God, made her worthy to become the Mother of the Son and Word of God. She experienced glorification in the Holy of Holies. Christ is co-essential (homoousios) with the Father according to His divine nature and co-essential with us according to His human nature. Some people in the early Church claimed that Christ was co-essential with the Father and with His Mother. The Church ruled at the Third Ecumenical Council that the All-Holy Virgin was to be called Theotokos, because she did not give birth to a mere man, but to the Word of God. The teaching about the Theotokos is therefore included in the infallible teaching of the Church. The Theotokos has an important place in the Church. The faithful have a spiritual relationship with the Church. Anyone who loves Christ also loves the All-Holy Virgin, who assisted in the mystery of the incarnation of the Son and Word of God and from whom Christ took human nature and glorified it. The relationship of the faithful with the All-Holy Virgin is not, therefore, simply sentimental but spiritual. The glory of the Theotokos is not a theoretical teaching, but empirical, as many saints have seen the glory of the Theotokos. In any case, the human nature that was assumed by the Word and united immutably, inseparably, indivisibly and unconfusedly with the divine nature, was glorified “at the same time as it was assumed” in the womb of the Theotokos. Christ was not gradually perfected, as human beings are. Christ is God according to essence, whereas man is glorified according to participation. Also, according to the Fathers of the Church, Christ brings about glorification: He is Himself the source of man’s glorification and does not ‘undergo’ glorification. Christ is God and glorifies others, like the other Persons of the Holy Trinity, whereas man is glorified. Christ revealed this glorified human nature to human beings by stages. “There is no question of Christ having passed through the stages of perfection, purification and illumination in order to reach glorification or theoria. There was no progress towards perfection in Christ, since He had glorification or theoria or participation in the union of uncreated glory from the very conception of His human nature in the womb of the All-Holy Virgin. He did not possess this by the grace of God, but naturally, seeing that He was God by nature and the actual hypostasis of the Word, Who was the only one of the Holy Trinity to become man by nature, uniting Himself with His own normal human nature, with all its natural properties, including the will and energy that are common to human nature in general. “After the incarnation of the Word, exactly the same method of revelation and glorification that took place with the Prophets is repeated with the Apostles. The difference now is that the Word reveals Himself in the natural and uncreated glory of His nature, which is shared with the Father and the Holy Spirit, by means of His own humanity. This humanity did not advance towards the continuous vision of divine glory, but was glorified through its union -not by grace but by nature – with the Word from the beginning of its existence in the womb of the Theotokos. Christ did not progress as a human being towards glorification, but was conceived as a glorified man, not by virtue of the union that the saints experience with the divine nature, but by virtue of the one unique natural or hypostatic union with the divine nature and energy. The saints understand this from their experience. When they reach glorification, the theoria of Christ’s glory in His human nature, they realise that Christ is the source of the uncreated Light, whereas they themselves are participants in the Light. The fact that Christ was perfect from the beginning was made clear on many occasions, even during His struggle with the devil. Christ voluntarily assumed the passible and corruptible aspects of human nature because He really took flesh. However, the so-called ‘blameless’ or natural passions — hunger, thirst, weariness, sleep — did not act in Christ by compulsion. Christ’s divine nature had authority over them. So Christ was hungry when He wished to be, thirsty when He wished to be, slept or rested when He wished to. The saints understand this to some extent from their experience. They too, when they reach glorification according to grace, observe a suspension of the natural and blameless passions: hunger, thirst, sleep and so on. In Christ this happened naturally because He was true God, and the human nature followed the divine nature. “The incarnate Word not only possesses the state of theoria naturally, not by grace, but even as man He Himself is the natural source of glorification and glory. If some of the natural and blameless passions are suspended in those who by grace are in a temporary state of glorification, how much more must those passions have no natural place in Christ, Who is glorified by nature and the source of glorification as man. So one can see why it is a basic doctrine of the Orthodox Church that the Word as man wants to have the natural and blameless human passions, and really to share in them, transforming them into a source of our salvation and a means by which we ourselves can overcome the devil and pass through the stages of purification and illumination on our way to glorification. On the one hand these passions are a result of the Fall, but at the same time, through the glory of the Cross, they become the source of our salvation, perfection and glorification, and the means by which the devil is defeated and destroyed. It should be noted at this point that the Triune God — the Father, the Son and the Holy Spirit — is present everywhere in the world according to energy but not according to essence. The God-man Christ, however, is absent from the world according to His essence as Word, but “the human nature of Christ is everywhere present according to essence”, by reason of the hypostatic union of the divine and human natures. This issue is linked with the teaching about the essence and energy of God, but also about the hypostatic union of the divine and human natures in Christ. At Christ’s Baptism in the River Jordan, John the Forerunner was accounted worthy to experience the Triune God. “It came to pass in those days that Jesus came from Nazareth of Galilee, and was baptised by John in the Jordan. And immediately, coming up from the water, He saw the heavens parting and the Spirit descending upon Him like a dove. Then a voice came from heaven, ‘You are My beloved Son, in Whom I am well pleased’” (Mark 1:9-11). Written by Metropolitan Hierotheos of Nafpaktos, from the book "Empirical Dogmatics, Volume 2"